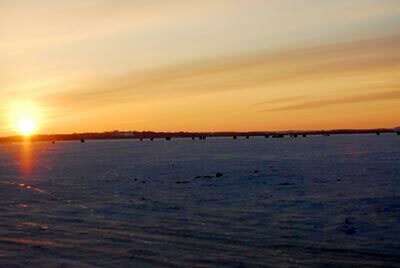 The sun rising over an ice hut village in Cooks Bay on Lake Simco. Many of Ontario's thousands of lakes are perfect for hard water fishing, and angling enthusiasts across the province are taking advantage of the great conditions. The Ontario Federation of Anglers and Hunters (O.F.A.H.) and the Ontario Conservation Officers Association (OCOA) remind anglers and anyone venturing on to frozen lakes and water bodies to put safety first. "Winter fishing is a terrific way to spend time outdoors, but anglers need to be sure that ice conditions are safe and they have emergency gear with them, just in case," said Lezlie Goodwin, O.F.A.H. Communications Manager. "Practicing some simple safety measures could save your life." "Conservation officers across Ontario regularly come across groups or individuals who are ill-equipped should trouble occur," said Mike Duncan, OCOA President and a Conservation Officer. "We strongly encourage everyone out on the ice to make sure someone knows where you are at all times and what time you expect to return. Should an accident occur, that critical information could greatly increase your chance of rescue and survival." Anglers are reminded to carry valid fishing, snowmobile and ATV licenses with them at all times. They should also be sure to review the 2011 Recreational Fishing Regulations Summary, available online and at MNR offices and license retailers. Let someone know where you will be and when you plan to return. To learn more about natural resources regulations and enforcement, please visit the OCOA website at www.ocoa.ca or contact your local Conservation Officer. With over 100,000 members, subscribers and supporters, and 670 member clubs, the O.F.A.H. is the largest nonprofit, fishing, hunting and conservation-based organization in Ontario, and the VOICE of anglers and hunters. For more information, visit www.ofah.org.